CASA began in the 60's/70's when antiwar demonstrations / protests were occurring at UC Berkeley and the Chicano consciousness began to percolate at American universities. The following are testimonials contributed by CASA Alumni / Friends of CASA. Do you have information on CASA members or activities during one of the following decades? Click on the "Contact Us" button at the bottom of this page, email your story / pics to us and we’ll post them. I started at Cal as a freshman in October of 1970. That next quarter, January 1971, there was announcement posted in Wurster Hall, inviting Chicano students to a meeting to discuss forming a new student group. Those who were at this meeting included Bob Esparza, Bob Daughters, Mike Orduno, Jorge Cortez, Antonio Pizano, Jose Arce, Antonio Risianto, Fred Atilano, Julio Martinez, John Borrego, Carlos Villagran, and myself. There was also a female, and I can only remember that her first name was Adriana (I think). Anyway, one of the first orders of business was to ask the school for some money to attend an event in Washington D.C., where the "Chicano Caucus" of the House of Representatives was participating in a conference to present contemporary issues regarding Latinos (Chicanos). A number of us went, (picture attached). Later another major milestone occurred when a class was organized for 15 units, and the topic was the study of architecture and Chicano culture. Tony Ward was the instructor. From there, CASA became what you know of it today. Bob Esparza was definitely the guiding force behind CASA in the early days, and served as a liaison between the group and the college very effectively. Establishing the Community Design Outreach Program with a twofold mission: to increase the recruitment of Chicanos to CED and offer design services to Latino / low income communities of color in the San Francisco Bay Area. Planning and supporting several on-campus political movimientos, such as organizing demonstration against the move to close the School of Criminology in 1974. 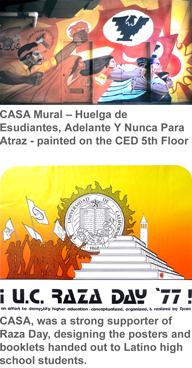 Painting the CASA Mural, Adelante y Nunca Pa'Traz, Huelga de Estidatiantes on the 5th floor of CED in 1977, which was subsequently painted over by CED sometime in the late 1980s. Playing a key role in Raza Day - the most innovative and successful Latino recruitment efforts at UC Berkeley ever (later copied at many leading universities across the US). The goal was to bring Chicanos to UC Berkeley for a day and "Demystify Higher Education." (I designed the first 3 Raza Day posters (’76, ‘77, ’78) and CASA provided very popular seminars at CED on the study of Architecture / Community Design. High school students were greeted at CED with an incredible slideshow / soundtrack (War’s “Lowrider”) produced by Carlos Rodriguez and Oswaldo Lopez. And every now and then we threw serious pachangas as fund raisers, with the proceeds going to community and non-profit organizations in various minority communities in the Bay Area.